This Slow Cooker Braised Pot Roast is sure to become a family favorite. It’s Sunday night dinner that can be made any weeknight with the ease of the slow cooker. 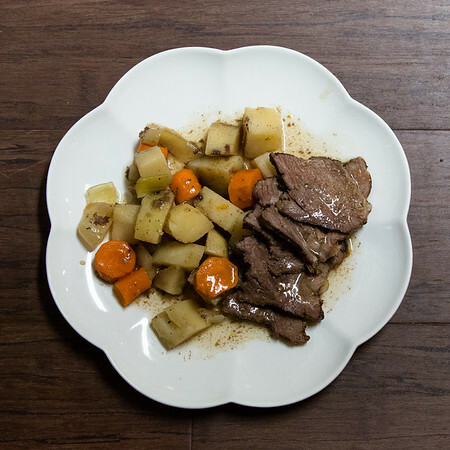 Carrots, potatoes, celery and onions all blend with the pot roast for a classic pot roast dinner. Post may contain affiliate links. Is there anything more suited for the slow cooker (crock pot) than pot roast? I don’t think so. 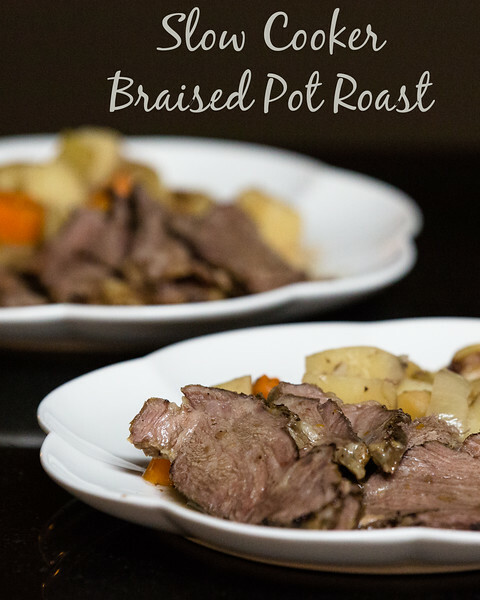 It is the perfect one pot meal and I can think of nothing I enjoy more for a Sunday dinner! There is something so wonderfully homey about pot roast. I eat a lot of foods now that I didn’t even know existed when I was young – kale, quinoa, and kohlrabi – to name just a few. But a good Sunday pot roast, that feels like it’s been around forever. It never gets old. Potatoes, carrots, onions, celery and meat all combine to taste exactly like I remembered it from when I was young. It is comfort food at it’s finest. It doesn’t even need a recipe really, though I did glance at a few I found in Not Your Mother’s Slow Cooker Cookbook (NYM Series) . The main differences between recipes are just your choice of liquid (wine, broth, water, vinegar), and your choice of veggies (potatoes, carrots, turnips, parsnips). I like to keep mine simple – just onions, carrots, potatoes and celery and either water or beef broth if I have it, salt and pepper and a bay leaf. It doesn’t need much more than that to be everything I want it to be. This Slow Cooker Braised Pot Roast is comfort food at it's finest! Liberally salt and pepper chuck on both sides and rub in. Place in slow cooker (some people brown first - I don't bother). Top with veggies and nestle in a bay leaf, seasoning again with salt and pepper. Pour over 1 cup of beef broth. Turn on low for 6-8 hours. If you'd like to thicken the sauce, mix 1 tablespoon of cornstarch with two tablespoons of water and stir into the sauce in the crockpot about 30 minutes before serving. Total comfort food faceplant of epic proportions! Love it! A great comfort food recipe!! Classic for a reason and my entire family loved it! This sounds so amazing! I love beef dishes!! Agreed. Pot roast = ultimate homemade dinner. I’m so sad that my little girl hates it.